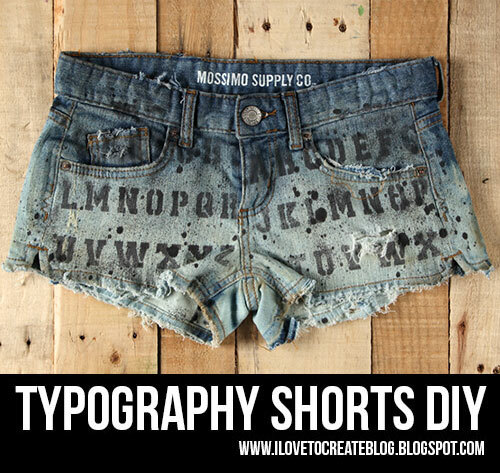 Over the next few weeks, we plan on sharing with you some fun DIY shorts designs that our design team and creative folks here at iLoveToCreate came up with on the fly. Our whole team had so much fun dreaming up ways to create some wildly cool shorts and each of us went for a totally different look. I was going for a super fun distressed typography look for mine, since I'm part graphic designer in my social media job :) I'm a super messy designer by nature, so if I can do them, you can too!! First I layed down a trash bag so I wouldn't get spray bleach all over the table. 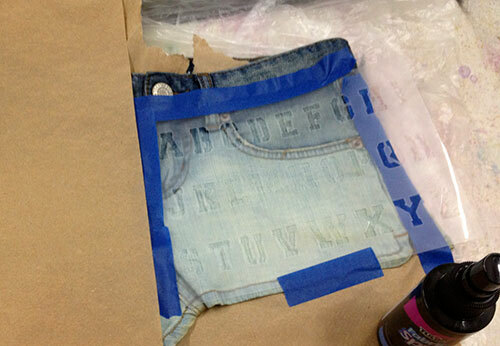 I then sprayed on the 50/50 spray mixture mainly to the bottom of the front and back of my shorts. Let them sit for a little while to let the bleach do it's magic. 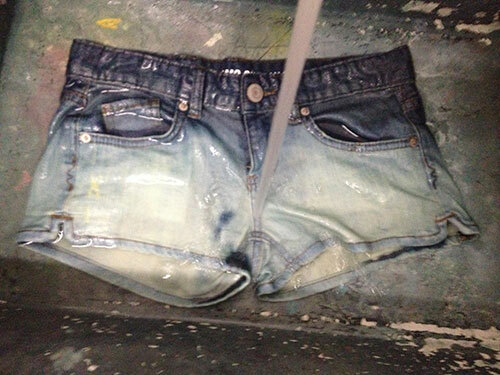 Now thoroughly rinse the bleach out of the shorts. Now put your shorts in the dryer or let them air dry before you move onto the next step. I next took some paper towels and put them in between my shorts so that the paint wouldn't bleed to the back. ...as you can see here, I blocked off with even more tape and spray before I started spraying. Now start lightly spraying your shorts. You'll want to hold the spray 10-12 above your jeans and lightly mist. You don't want to over saturate as it can cause the stencil to bleed through if you put to much or go too closely to the surface! It will look like this when you are done. 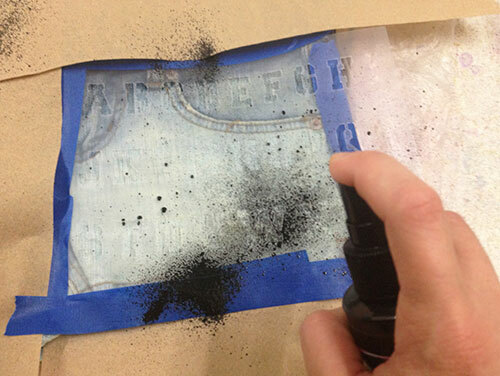 Carefully remove the stencil, tape, and towels and do another section. Flip over and also do the back as well. 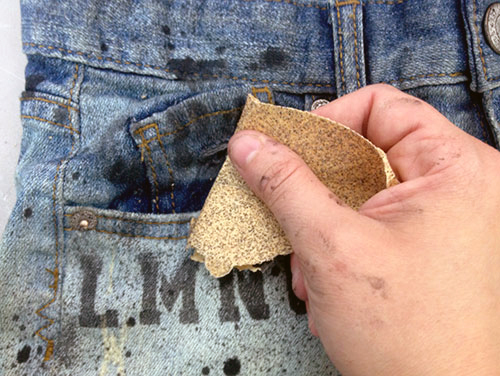 I wanted to add a little more grunge to my shorts, so I started spritzing mor spray on the front of my shorts. I was going for a grungy spray painted look with some fun blobs and large drips of paint. Once you finish, let dry for an hour or two or else it will smear if you start distressing them. 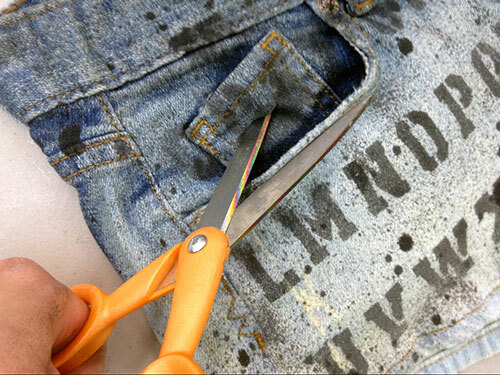 Once the paint is dry, start cutting your shorts and using the scissors to create ripped accents. I also used some sandpaper to distress my look. 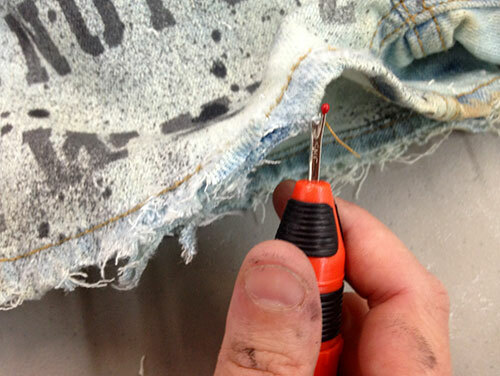 Finally, I broke out my seam ripper and cut through the hem on the bottom of my shorts. I wanted them super ragged looking! And here's the finished look! I love how they turned out! Since the ones I made are size three, I'm kinda contemplating if I should make a pair of my own. I'm SO not a size 3 like our model....Haha!!! Here's a detail of some of my distressed effects. And here's the back! So cute! Thanks for stopping by and checking out my project. 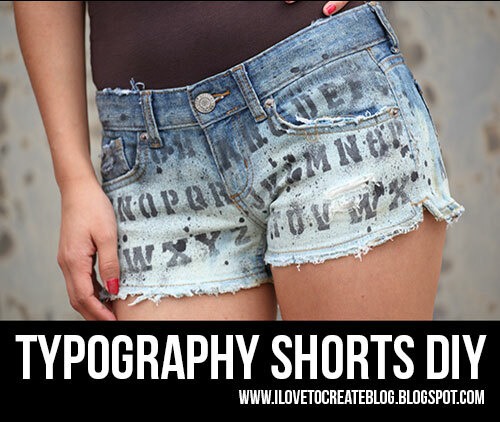 You can find other fun typography DIYs at my web site FontCrafts! The stencil isn't on the supply list and there isn't a source listed for it - any suggestions? 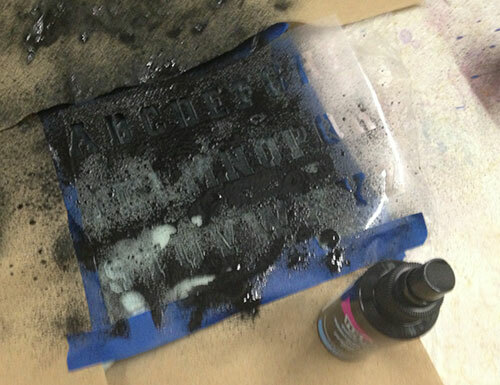 The last time I asked at an art store (yes, a good one), they said they hadn't seen stencils in years. I really don't want to have to cut my own. Thanks! You filled the bottle 50/50 with bleach and water? How long do you let your bleach dry? Or when you know your shorts are ready to wash? I definitely love these. I think I’d like to try with a jean skirt or something. So cute! Hey Alexa. I read this blog last week and decided to do this DIY. 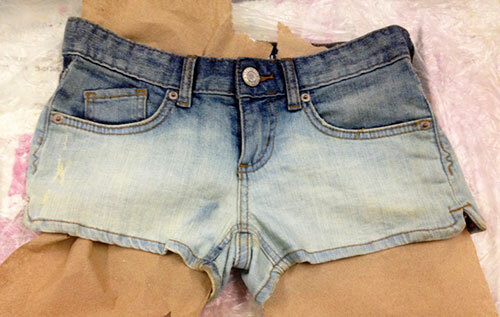 I came up with a fabulous short after doing this DIY with my denim pant that became useless before I DIYed it. I got tons of compliments from my friends. Thanks a lot for sharing. Really cute! Pinned:) How do I become a contributor?